In these essays, the author tries to address practical issues of teaching and learning from historical perspectives, to see what insights Quakerism in particular has offered, and to discover what influences have been most powerful on Quakers concerned with education. 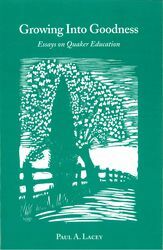 The first four essays address issues of current practice in Quaker education: the spiritual purposes of our schools, how schools interpret the phrase “that of God in everyone,” the place of the meeting for worship, the business method and the testimonies in the educational project. The next three essays examine some perennial issues: finding suitable teachers, addressing the economics of Quaker education, and discovering what a “guarded education” ought to be. The final three essays survey affinities with and influences from several philosophies of education, among them the work of Comenius, Pestalozzi, Froebel, Montessori and Dewey, and discuss the connections of ethics and ethos in Quaker education.